Bus and tram tickets can be bought at various tabacs (tobacconists). 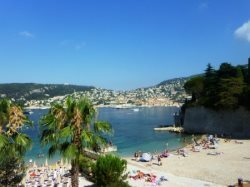 Multi gives 10 reduced-rate tickets, while a Pass 1 Jour provides unlimited 1-day travel in central Nice. Driving can be tricky during summer months, as street parking is hard to find. It's best to park in a multi-storey car park and walk to your final destination. A 24-hour car breakdown service is available (tel: +33 (0) 4 93 89 80 89 or +33 (0) 4 97 00 03 33). Buses are reasonably-priced, although they may not be the quickest way to travel during peak times. Ligne d'Azur offers over 40 day-time routes and 4 night-time routes. Bus tickets can be used on all trams enabling mixed tram-bus journeys. Taxis are readily available from Nice train station, as well as key tourist locations such as place Massena, place Garibaldi or promenade des Anglais. Otherwise, it is best to book taxis in advance rather than trying to hail one in the street. Prices are approximate and may vary within a specific town depending on the drop-off point. (The taxi fare must be displayed on the taxi meter). Payment : cash only ! - Day rate (7am to 7pm) : €1.68. - Night rate (7pm to 7am + Sundays and bank holidays) : €2.24. - Pick-up charge : €2.80. - Waiting time or slow driving per hour : €28.20. - Minimum fare : €6.10. - Per suitcase : €0.72. - Trunk or big package : €1.33. - Animal (excluding guide dog) : €1.33. - Airport surcharge : €1.48. - Surcharge for 4th passenger : €1.43. - Surcharge for snow/ice : 10%. - Plus motorway toll fees. Nice s city centre is best explored on foot and finding a parking space, particularly in summer, can be problematic. You can expect to pay up to €4 per hour and €30 for a day. A car does give you the freedom to explore the Cote d’Azur at your leisure via the swift A8. Nice's tramway is a convenient way to get around in central Nice. Line 1 provides a north to east connection passing through the city centre via the avenue Jean Médecin and the place Massena. Walking is often the quickest way to get about central Nice. Look out at the Mediterranean Sea as you wander down the promenade des Anglais. The Monaco Bus Compagny propose you a touristic travel card for 3 €. This card is without travel limitation. You can buy it directly with the bus driver. Number 1 : Monaco Ville - Saint Roman (Round trip). Number 2 : Monaco Ville - Jardin Exotique (Round trip). Number 4 : Condamine - Saint Roman (Round trip). Number 5 : Fontvieille - Hôpital (Round trip). Number 6 : Fontvieille - Larvotto (Round trip).